Writing letters to the editor is a free, fast and effective way to reach your entire community (and beyond!) to let them know why you support your local public schools. Effective letters to the editor are short (250 words or less), to the point, and personalize the larger issue or concern to your community’s needs. Make it personal by sharing your story or perspective, and appeal to values you share with members of your community. Stay focused. Stick to one main point, issue, or problem. Be current. Use news, current events, upcoming elections and other things your community is already thinking about to show the relevance and urgency of your issue. Reach a broader audience with your message by sending your letter to multiple papers throughout the state or region, and by sharing the link to your letter widely once it’s published online. Below are sample letters you could use as templates or inspiration for your own. Now how each one stresses the value of public schools, concerns about their future/current issues, and how to get involved or take action. The letter from Wisconsin Public Education Network partner Carol Lenz of Fox Cities Advocates for Public Education was published in the local paper, the Post Crescent. As the children in my neighborhood head off to school, I reflect on the heritage of our great Fox Cities public schools. Although my own children are grown, I am proud to support our public schools both through my tax dollars and as a member of Fox Cities Advocates for Public Education. Public education is a cornerstone of democracy. Because we all benefit from an educated citizenry, we promise, as enshrined in Wisconsin’s constitution, to provide a quality and equal public education for all. Our shared investment and local governance are examples of democracy in action. It was disheartening to hear Heartland Institute’s Bruno Behrend hail the expansion of school choice in Wisconsin, saying that it accelerates the “dismantling” of public education. The privatization of public education is the end goal of the American Federation of Children, the Alliance for School Choice, the Bradley Foundation and ALEC, all of which supported the elections of many of our state legislators. They are draining funding and local governance from public schools. Turning the minds of our children over to private and corporate interests, where government by “We the People” is replaced by private or corporate rule, threatens our very democracy. 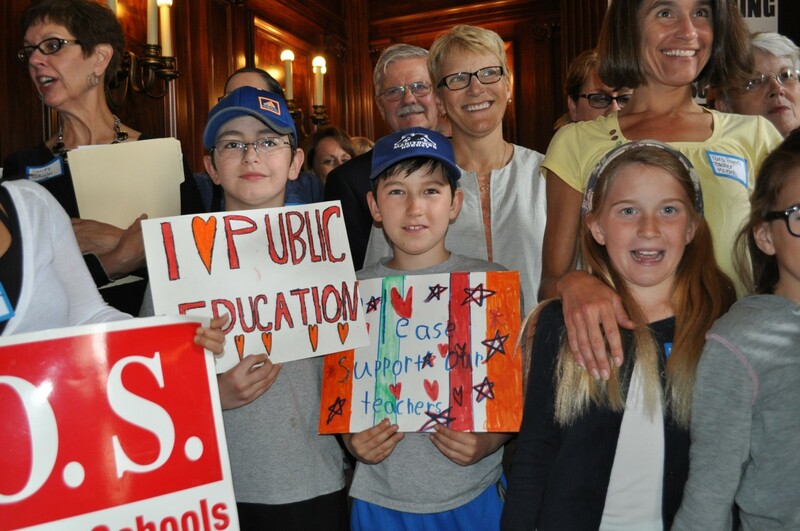 Fox Cities Advocates for Public Education is a nonpartisan group of concerned citizens who value public education and its vital role in a democratic society. We support our public schools because we care about each other. We believe in shared responsibility because we all benefit from an educated citizenry. We believe public money should be used for public schools. We want our public schools to remain “public” because they keep the American Dream alive for everyone. Find Fox Cities Advocates for Public Education on Facebook for information on upcoming meetings and events. Join us. The next sample is a letter from Tom Beebe that takes issue with a recent editorial. Writing letters in response to what’s NOT covered by your local paper, or what’s left out of the story is a great way to inform your community of the big picture they might not otherwise see. Our public schools are the heart and soul of every community in the state. They are the economic engine, the social touchstone and the cultural repository of our cities, towns and villages. Public education is a value we all share. Why, then, would the State Journal write the July 31 editorial, “Flat property taxes are a welcome relief,” praising our governor for giving a minimal property tax break to folks, financed on the backs of our children and those public schools? If the governor and legislators want to control property taxes, then do that — cut them, limit their increase, or convene a blue-ribbon panel to look at them. Don’t, however, cut property taxes a few cents by taking teachers, programs and services out of our public school classrooms. That editorial didn’t do a good job of explaining the truth. And, the governor can do better than to hurt public school children by funding small property tax cuts and other political gimmicks. EDITOR: A recent full-page color ad in the Stevens Point Journal encouraged readers to contact area Catholic schools about “free tuition.” By “free tuition,” did the ad mean “taxpayer-funded vouchers”? Vouchers are not free. They are paid for by our tax money, and in this case, tax money we paid to fund our public schools. In Gov. Scott Walker’s proposed budget, every new voucher in our district will be paid for by the Stevens Point Area Public School District. This is in addition to a proposed $1.1 million cut to Stevens Point public schools next year, also in Gov. Walker’s budget. At a time when we should be thoughtfully reinvesting in our public schools, legislators are finding more ways to take taxpayer money away from them. And School Choice Wisconsin and others are finding clever ways to not say where our money is going.